Walter Laqueur traces Zionism from its beginnings—with the emancipation of European Jewry from the ghettos in the wake of the French Revolution—to 1948, when the Zionist dream became a reality. 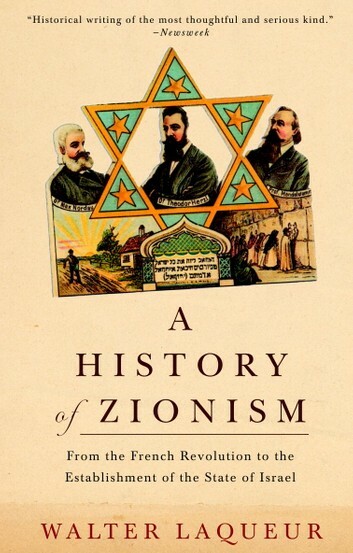 He describes the contributions of such notable figures as Benjamin Disraeli, Moses Hess, Baron Edmond de Rothschild, and Sir Herbert Samuel, and he analyzes the seminal achievements of Theodor Herzl, Chaim Weitzmann, and David Ben Gurion. Laqueur outlines the differences between the various Zionist philosophies of the early twentieth century—socialist, Communist, revisionist, and cultural utopian—and he discusses both the religious and secular Jewish critics of the movement. He concluded with a dramatic account of the cataclysmic events of World War II, the clandestine immigration of Holocaust survivors, the tragic missed opportunities for co-existence with both the Arab residents of Palestine and those in the surrounding countries, and the struggle to forge a new state on an ancient land. Laqueur’s new preface analyzes the present-day difficulties, and places them into a fascinating and aluable historical context.